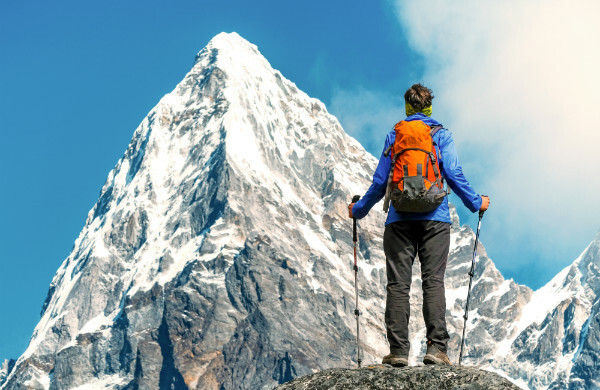 Behavior change is very challenging, and—like climbing a mountain—requires a fair amount of physical and mental training. It almost always makes no difference if we have an intense desire for change.It also doesn’t matter if the will for change is internal (such as changing your daily routine to do more sports to get in shape) or comes from external sources (when a doctor tells a patient to quit smoking). More often than not, long-term behavior remains unchanged. That’s because humans are creatures of habit: We do things we are used to doing, and doing so often gives us a sense of security and confidence. It also doesn’t matter if an employee is 100% motivated to attend a sales training, research has shown that “with little practical follow-up or meaningful assessments, some 90% of new skills are lost within a year,” according to a 2012 study by Eduardo Salas, a professor of organizational psychology at the University of Central Florida. 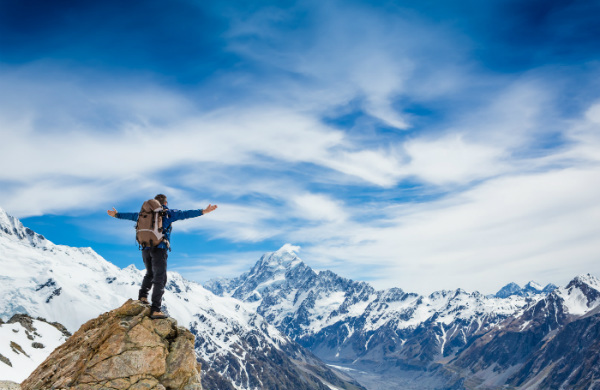 Even with 100% focus and a clearly coordinated strategy, most people never reach the peak and also never manage to truly change their behavior in the long-term. With advancements in research related to human learning processes, it is possible to combine many learning strategies to ensure that practical follow-up and meaningful assessments are integrated into training programs to bring about long-term behavior change. But how can employees and businesses profit from the latest advancements in educational research and methods? How can we bring about real, long-term behavioral changes to get the most out of employee training? In his article entitled, How Learning Can Change Behavior, Produce Results, Bill Wilder from the Life Cycle Institute recommends that organizations follow the “3A learning process” for employees to experience long-lasting behavioral change. The three “A’s” stand for Align, Assimilate, and Apply. Aligning must take place before a learning event. The manager or someone from the company has to tell the employee what they should gain from the training. While this seems like a small and unnecessary step—it is, in fact, just the opposite of that. When the employee knows what their supervisor will expect from them in the end, it’s much easier for them to focus on the topics that are useful for the organization instead of concentrating on the wrong topics that may only offer limited value to the company and individual in the end. Aligning employee needs and employer needs before the training also has a psychological effect on the trainee: They will feel like they are on a mission to gain new knowledge for their team and company and not only for their own needs. Additionally, they will realize that they need to share and communicate the lessons they learned to their teams. This makes them feel more responsible for really learning the material. It’s logical that someone more easily absorbs information on topics that resonate with them. With the right alignment, the “valuable” learning for the company will be aligned with the employee. But how can assimilation be leveraged? Simply by practicing the newly gained knowledge within the learning process. If there is no possibility to use the new information in a real-world application, the employee will gain a general awareness of the issues but not be able to prove that what they have learned will work, nor will they really know how to do things. They are also much more likely to quickly forget what they learned. To avoid these common pitfalls, it is necessary to choose the right trainer or facilitator as well as the best company to meet your needs. Applying newly acquired knowledge in the workplace is where the real learning takes place. What often hinders employees from applying new methods or knowledge? Often it is a lack of experience and a lack of confidence. To avoid this, supervisors need to encourage employees to give things a try and support them even if they fail at first. Managers must support their employee’s efforts to take risks and try out new things. They must plan for extra time in case things fail. This will build their confidence and mitigate their fear of making mistakes. Yet another reason for supervisor buy-in at the beginning of the process is that, if everyone is on board to begin with (the supervisor and their employee), there will be much less resistance from the organization and the supervisor is a lot less likely to hold the employee back. The 3A learning process is also similar to the ideas put forth by Charles Jennings, Co-Founder of the 70:20:10 Institute, in his article, “Learning is Behaviour Change: Why is it often so hard to help it happen?“ where he makes a strong case that CEOs and learning professionals should act as change agents to foster learning rather than merely getting trainees to remember something. The difference between these two terms is that remembering is linked to the short-term memory to recall facts and figures like much of what we did in school and at university. Learning goes one step further and is linked to experiences to generate new ideas, mix with previous knowledge, and get stored in our long-term memories. How can we help trainees not only remember facts but also change their behavior? The answer is that we need to create environments where emotional responses, rich experiences, and social learning are part of daily routines to help employees really learn. As we know within the context of storytelling, when we engage the emotional part of the brain, we are more likely to learn. This theory, of course, holds true when it comes to behavior change. Therefore, it is necessary for learning professionals and managers to speak to the feelings of their trainees and employees. But what feelings should be addressed: positive or negative ones? On the one hand, our gut instincts might lead us to say the positive feelings. However, positive feelings are often not as memorable. Drama and negativity heavily impact our brains. Whether it is rumors about a restaurant serving unsafe food, or sports (e.g. the Vettel-Hamilton incident at this year’s Baku Grand Prix of Formula One), these negative experiences engage more of our brains. Once again, the same is true for learning: Sometimes it is better to talk about negative feelings. 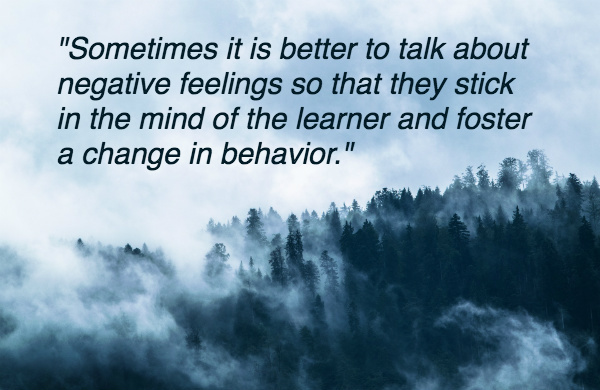 Then they stick in the mind of the learner and foster a change in behavior. Remember that time you showed up for a meeting with a client a day late because you didn’t sync your calendars? Remember that time we went hiking without checking the weather forecast? We got stuck on the mountain in dense fog. Humans are highly social. We constantly seek out friendship and connections in our social environments. Why shouldn’t this remain true when it comes to learning and behavior change? It is beneficial for behavior change when people can exchange their experiences, thoughts, and feelings about different topics and methods. This has two positive impacts on behavior change. First, employees won’t have the feeling that they are the only one who deals with a matter. Second, it fosters confidence because it will be clear that nobody is perfect and that everybody struggles and makes mistakes when incorporating new knowledge and skills into their daily routine or behavior. To recap: It is advisable to invest time aligning employees with the right training company for them. This will increase the chances that they get the desired results before they jump into a training. Assimilating fact-based knowledge through practical interaction during the training is essential. Also, supervisors must provide trainees the assistance and support they need to apply their fresh knowledge daily. 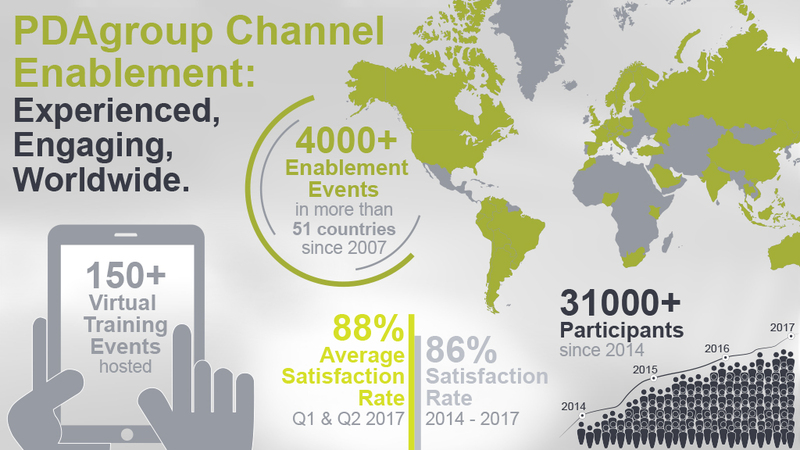 It is also beneficial to create environments where employees can exchange their feelings and experiences to facilitate social learning and behavior change. That’s how to overcome massive challenges and reach your goals—as individuals, teams, and an entire organization. Having a culture that allows for failure is essential for organizations to get the most out of learning. I have experienced that there is a common pattern when it comes down to failure. Typically, people focus more on whose fault something was. Instead, the focus should be on how to solve the problem. When we ask “Who did this?”, we spread the message that blaming someone is more important than problem solving. However, if we wait until after the problem has been sorted out, there is more room for an in-depth evaluation. The “guilty” employee is more likely to reflect honestly on their performance. That way the root causes of the problem can be more easily identified. When things are done in this manner, anxiety related to failure is reduced within the organization. People implement new knowledge and change their behavior as a result. And this is the best environment in which we can all achieve long-term behavior change and reach the peak together. PDAgroup specializes in analyzing your organization’s needs and developing engaging concepts and curricula to bring about behavioral change. This change will make your business more sustainable in the digital age. Find out more about how PDAgroup can enable your organization’s best performance. Connect with Andreas via LinkedIn.